FAANG Companies: Why Are They So Hot? What’s interesting about the FAANG is how those companies together form more of an ecosystem of how people consume content, purchase things and find information on the web. Thus, it is worth giving a look under the hood of the companies that comprise the FAANG ecosystem. When we speak about tech, in the last decades we often refer to the IT space. With the rise of the web, a new wave of tech companies have taken over the business world. Those tech companies have the ability to influence the way people behave, consume content and purchase things. FAANG companies have been able to become multi-billion dollar businesses relatively quickly. For instance, in 2017 Facebook passed the $40 billion revenue mark. While Google passed the $110 billion revenue mark. Apple by far was the tech company with the highest revenue at almost $230 billion. 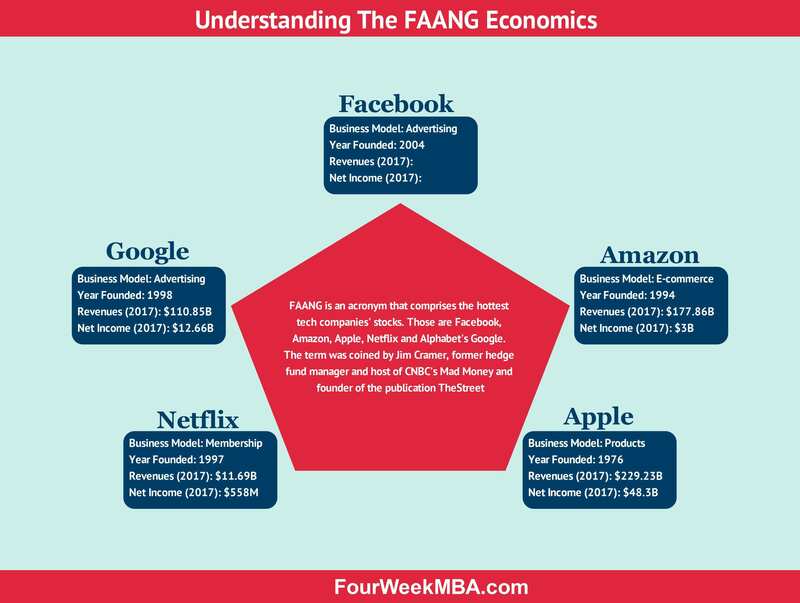 It is critical to notice that the FAANG companies run different business models. And that is also why they carry a different level of profitability. In some cases, a lower profitability might be driven by the industry in which one of the FAANG operations but also from strategic choices. For instance, even though Amazon is the one with the highest revenues, right after Apple, it is the company with the lowest net income, after Netflix. I’ve explained many times how Amazon runs a cash machine business where with extremely low profits it is able to generate massive cash flows. Instead, if we look at Apple, the company has high revenues and high margins. This is in part due to its razor and blade strategy and also thanks to Apple’s to keep high margins on its iPhone and related products. It is important to notice how most of the FAANG companies have been investing in other areas to diversify their revenue generation. Beyond Facebook, and Netflix which primarily make money via advertising (the former) and membership fees (the latter), Amazon, Apple, and Google have a more diversified revenue generation. Google, now Alphabet made 86% of its revenues via advertising, yet Google isn’t just about advertising anymore. Even though online stores, is still Amazon primary revenue generation stream, there are other segments of the business that are quite interesting and might become massive in the coming decade. Indeed, Amazon AWS, born as an experimental business unit it has become a competitive and large business in its own sake. Amazon also started to generate a good chunk of its revenues via membership with its Amazon Prime Subscription Program. Another interesting aspect of Amazon is its ability to generate revenues via advertising and third-party seller services. In short, the Amazon business model is like an octopus that is able to get in and be successful in many industries with several revenue streams. As Jeff Bezos would put it, it’s all about being in day one. Apple revenues still primarily depend on the sales of its iPhone, yet considering Apple just a product company might be limiting. Apple srenght is definitely in its brand and the unique experiences it has been able to design via its devices that integrated work extremely well together. What’s so special about that FAANG? In this historic period, FAANG companies managed to get most of our attention. There isn’t a single day when one of those companies make the news. Yet what is hot today might not be so tomorrow. So the question is, would those companies still be so hot in ten, twenty years time?